“Marriages are made in heaven,” but it is on the person to search for a bride or a groom. With the advancement in technology and overseas relationships and connectivity, matrimony sites come as saviors. You create a matrimonial profile, search according to your likes and dislikes, match a person, get to know each other and select the “perfect match” to marry him/her. These websites being user-friendly can easily be accessed by both the youth and the elders in a family. There are a lot of features that attract people to comfortably put up their profiles on these sites such as the privacy option. It allows both the parties to access each other’s full profile only when they are genuinely interested. These websites have gained popularity and trust because they have managed not to let this platform turn into a dating site and have won credibility for upholding the sanctity of marriage. The advantages of these matrimonial sites are many such as the personal choice and increase in options being global-social platforms with a specific and target purpose of matrimony. 1) One Should Be Honest With the Information Provided: The information you provide must be correct and complete. One should always be honest when providing information about oneself as wrong information can get you an expression of interest from another person, but ultimately, it is the authenticity of information that helps you get the perfect match. 2) Pictures Are the Heart of a Profile: Pictures are a must as they constitute the most crucial part of matrimonial profiles. Photos create an impression that attracts viewers. One should upload as many pictures, in different profiles and scenarios, as possible as they help the other person to know your personality and most importantly, how you look. One should upload pictures that are naturally clicked. It should not be group pictures, and preferably, the background should be your home or office as it creates a trust factor with the person who is making a choice. Photos should not form an impression that they have been clicked for the sole purpose of putting them on the website. You should also never use a dated picture. 3) Make Sure Your Profile Is Adequately Detailed: The bigger the profile, the better it is! One should add all the essential details about oneself including the links to their social media profiles (Facebook, Twitter, LinkedIn, etc.) as it amounts to authenticity and the other person can go through the profiles to know you better. 4) Being Self-Centric Is A Big No: It’s true that a matrimonial profile is all about you. But, don’t be too specific about it. For example, while creating a Gujarati matrimonial profile, don’t be too specific about the cultural aspects, even if you are searching for a Gujarati bride or a Gujarati groom. Be flexible so that a person can initiate an interaction as the matrimonial profile is on a global platform, and there should always be scope for interaction with other people to make an informed choice. 5) Mentioning the Family Background: This is one essential element that must be included in your matrimonial profile. Matrimonial site, not being a dating site, should include information about your family, who all are a part of your family, what they do, etc. This helps the other person and his/her family to know a little bit about the status and background you belong to. It also forms an integral part of your personality at times. 6) No Scope of Errors: The sanctity of marriage relies on truth & faith. Therefore, one must be true and correct about the information provided in the profile for the other person. This is because, at the time of the personal meet, it can be disastrous to find out about the false information you put up on the profile. It also includes being grammatically correct as it forms an impression on the other person and being grammatically wrong won’t make for an impressive profile. 7) Partner Preferences: A matrimonial profile consists of two parts – personal information and partner preferences. On the one hand, while writing down the personal information, be honest about it and don’t oversell yourself. On the other hand, while mentioning the partner preferences, don’t be unreasonable about it by expressing high expectations. Be balanced about it. One should be sensible and subtle enough with the words while mentioning them. 8) Get A Second Opinion About The Profile: It is always a good idea to get your matrimonial profile reviewed by someone who is close to you. It can be a family member or a friend as they are also the ones who know you closely and have a different perspective than you. They can advise you on some modification in the profile or about your personality (according to them), which could be a positive change to the profile. 9) Browse Through the Profiles of Other People: It is an excellent way to make your profile impressive. One can scroll through some top profiles on the site to know how they should introduce the information in a more presentable manner. However, don’t copy the same information or pattern out of a profile as it can easily be figured out by intelligent people. Be creative and honest enough to pick up suggestions for yourself to include in your profile. 10) Don’t Lose Hope and Heart: There is always someone, somewhere who is made for you in heaven. Therefore, don’t lose hope over delayed responses or no matches. There will be times when your interest requests would be rejected, or you won’t get the desired results of your choice. Be patient and hopeful as sooner or later, you shall find your soulmate who matches your preference, and you match theirs. So, what are you waiting for? 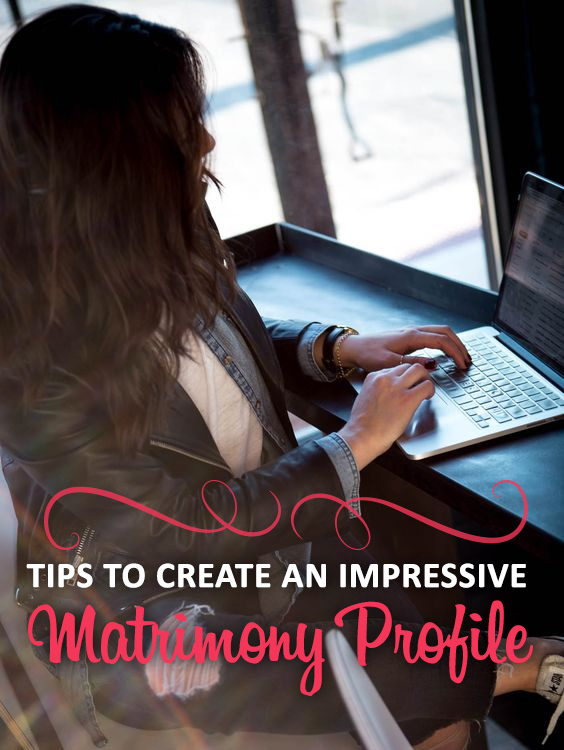 With these tips in your pocket, get cracking on your matrimonial profile today! This entry was posted in Matrimonial Buzz and tagged brides for marriage, Indian bride, indian groom for marriage, Indian Matrimony, matrimonial site, matrimony site on November 13, 2018 by TSILV.